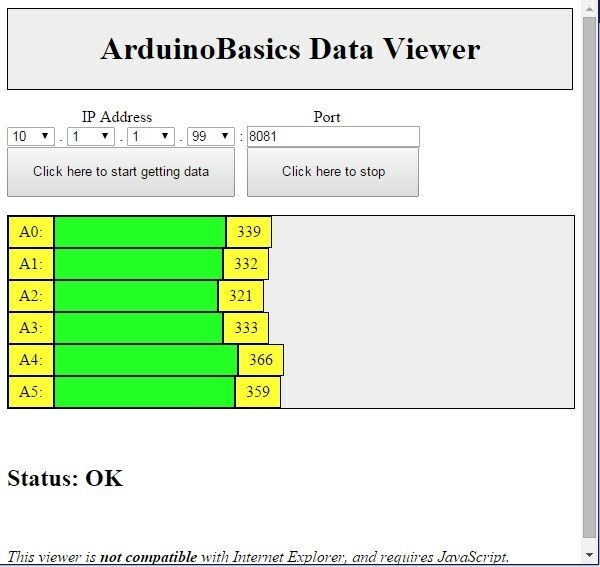 To establish the realtime communication between the Arduino and a web browser, the PubNub Data Stream Network (DSN) is used. PubNub provides global infrastructure and allows you to build and scale real-time apps and IoT devices quite easily. Building the Hello World of hardware, a LED blink. Writing your Johnny-Five code to make it blink programmatically. 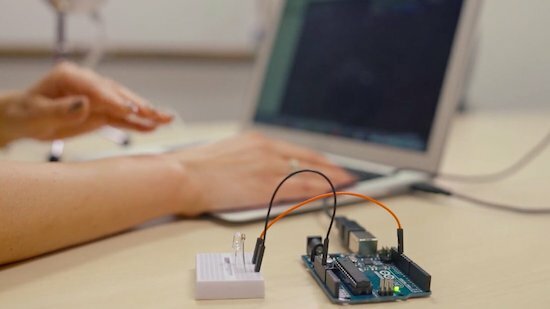 Have you ever wanted to transmit Arduino data over the internet? In this tutorial, we will design a web page that will retrieve Analog readings from the Arduino's Analog Pins and display them on a bar chart within the web page. The web page will use jQuery and AJAX to request the data from the Arduino Web Server, allowing us to update the bar chart dynamically, without having to refresh the entire web page. The Arduino Web Server will send the Analog readings to the web page in JSON format where it will be processed and displayed accordingly. 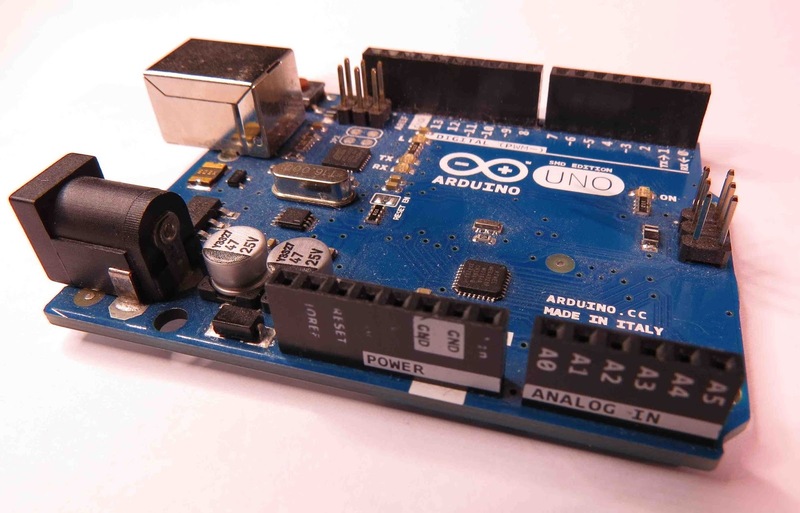 In this tutorial, I will not have anything connected to the Arduino's Analog pins, which means the data retrieved will be that of randomly floating analog pins. Feel free to connect a potentiometer, temperature sensor or any other analog sensor to these pins if you want to create a more "useful" project. The main aim here was to show you how to transmit the data in JSON format, and to update only a portion of the web page using asynchronous communication (using AJAX), to improve the performance of data retrieval and visualisation. 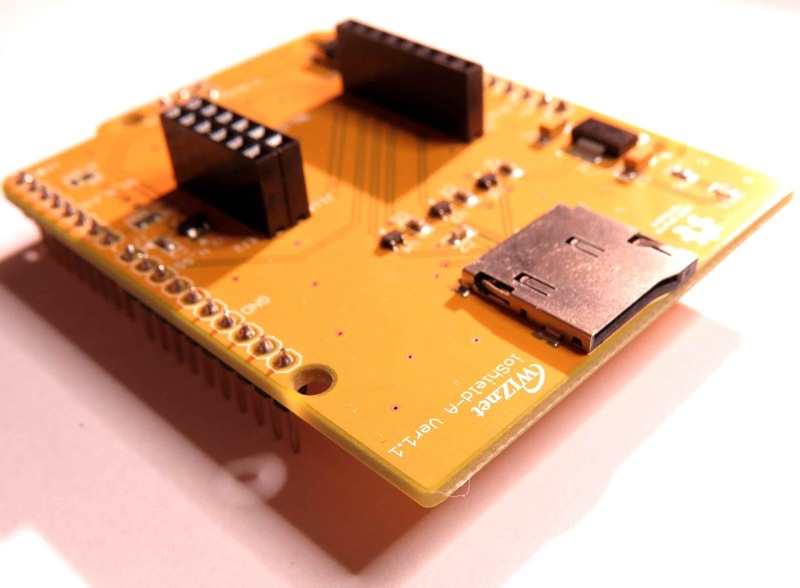 To program the Arduino you will need to download the Arduino IDE, and install the WIZnet Ethernet Library. 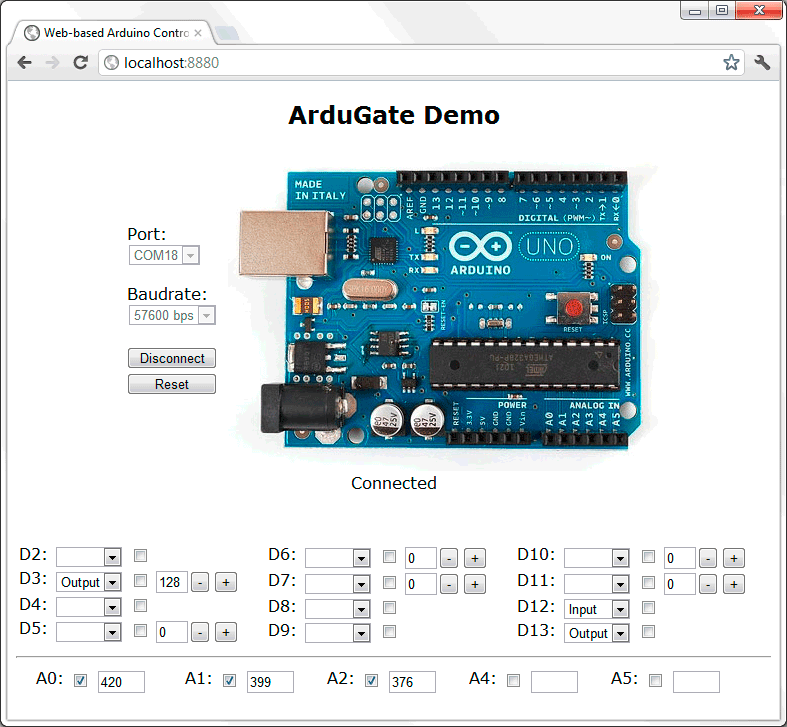 The Arduino IDE version used in this tutorial was version 1.6.4. You may want to read the WIZnet wiki information for each WIZnet shield before use. Full description of the Arduino code is included in the YouTube video above. Once you have set up your Arduino Web Server, you should be able to ping it. Look at this website, if you don't know how to use the windows ping feature. You can test this project on your local network. You just have to choose an available IP address and PORT within your router's IP range. If you don't know your local IP address range - you can have a look at this site to give you a helping hand. If you want to access your Arduino from anywhere in the world, you need to set up Port Forwarding on your internet network router. The following useful guides will hopefully get you on the right track, if you have never set up Port forwarding. I programmed the Arduino Web Server to listen for Web Browsers on port 8081. The web browser should display the Arduino data in JSON format (the YouTube video above will show you what that looks like). 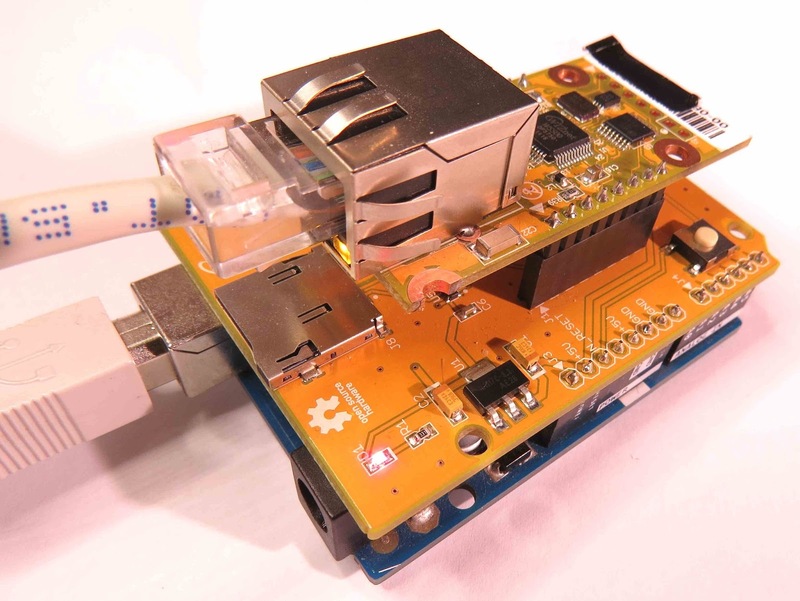 Once I knew I could connect to the Arduino in my internal network, I then set up port forwarding on my router so that I could type in my external IP address and special port to tunnel my way into my Arduino Web Server on my internal network. This is what I had to do on my router, but you may need to do something different. My first step was to find out my public/external IP address by typing "what is my IP address" into google. If you want to know your external IP address click here. I then typed my router's ip address into a web browser, and logged into my router. And now I can access my Arduino Web server from anywhere in the world. I can even access it from my smart phone. Once again, this will only return the Analog data in JSON format. Instructions on how to use these web pages, are listed below the HTML code. To retrieve data from your Arduino Web Server, please make sure that it is connected and visible from outside of you local network. You will need to have port forwarding enabled. Information on port forwarding is described above. Find what your external IP address is. Enter the port forwarding port number (eg. 8082) into the box labelled "Port"
If the bar charts do not move, and the status message says "Failed to get DATA!!" - then the web page was unable to connect to the Arduino for some reason. You may want to type in the web address into your web browser, to make sure that data is being retrieved. Have a look at Developer Tools within Google Chrome to help diagnose web page related issues. 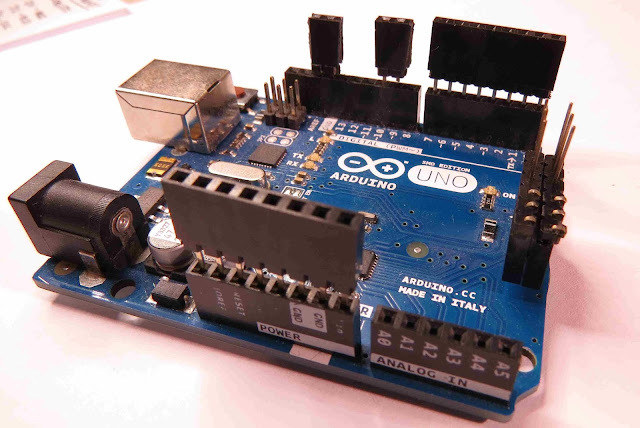 This tutorial showed you how to connect to your Arduino UNO over the internet, and retrieve data in JSON format using jQuery and AJAX. The web page can be modified to suit your own needs, plus it would be more useful if the Arduino was actually monitoring something, rather than logging data from floating pins. It would also be useful if the Arduino could be controlled to blink an LED, or to turn a motor... but I will leave that project for another day. I hope you enjoyed this tutorial - if it helped you in any way, please consider donating a small "tip" into my money jar. Thank you. This project would not have been possible without WIZnet's collaborative effort. Please visit their site for more cool Ethernet products. 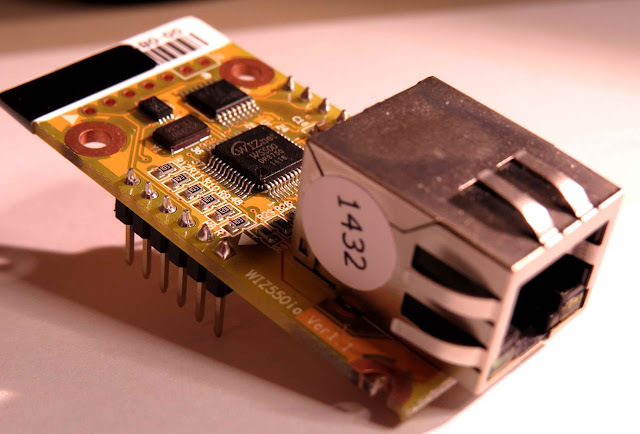 Please note: The WIZnet ioShield-A ver1.1 actually comes with the WIZ550io board. So if you buy the ioShield-A, you will receive both boards. I have provided the link to the WIZ550io shield because you can buy that shield on its own. Regardless, you will need to use both boards for this tutorial. This tutorial showed you how to connect to your Arduino UNO over the internet, and retrieve data in JSON format using jQuery and AJAX. The web page can be modified to suit your own needs, plus it would be more useful if the Arduino was actually monitoring something, rather than logging data from floating pins. It would also be useful if the Arduino could be controlled to blink an LED, or to turn a motor... but I will leave that project for another day. Thank you. I'm trying to create a google+ hangouts application to let us to control a robot (like magabot, for example), directly from there. I already created the interface of the application, it is actually pretty simple, if you want to have a look it is hosted here: http://magabot.cc/hangouts/magabot-hangouts/.